Over the last 20 years we have been replacing old and damaged timber frame sashes. 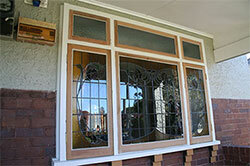 We can do double hung windows, casement or fixed windows. We can remake the timber sashes to the original size and also replicate all the different decorative profiles on the sash, so when we reinstall the panel they are exactly the same as the one next to it, making it almost impossible to ever know that they have been replaced. Whether you would like to freshen up the front façade of your house or just want to reopen that window that has been stuck shut for years, how about we replace the sash for it to just open it with ease again, wouldn’t that be lovely? We can fixt it. Our tradesman will go through the process with you before we start, we can normally get the job done within two weeks and we clean up after we have finished, we also do sash cords and can replace your hardware for you if required. So if you are in need of sash replacements, leadlights, glass splashbacks, frameless shower screens or general glass and glazing, you can trust in Lawrence Leadlights.